Meanwhile, heat oil in a large skillet over medium high heat. Cook eggplant for 4 to 6 minutes, stirring occasionally. Stir in Pasta Sauce and red pepper flakes. Reduce heat to medium and cook for for 5 to 6 minutes, or until heated through, stirring occasionally. Stir in basil, and season with salt and pepper to taste if desired. Serve hot with cooked pasta. Garnish with grated Parmesan cheese if desired. For a little milder flavor, reduce crushed red pepper flakes to 1/4 tsp. 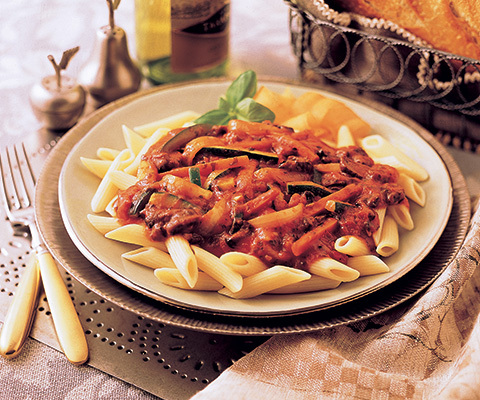 TIP: If desired, substitute Classico Triple Mushroom Pasta Sauce with Classico Traditional Sweet Basil Pasta Sauce. You don't say what pasta sauce you used. I would like to try this recipe.